Synology's j-series NAS units have traditionally provided consumers with a very budget-friendly entry-level window into the DSM (Disk Station Manager) ecosystem. As the amount of user-generated data in the average household keeps increasing, the demand for more resilient storage keeps going up. With drive capacities on the increase, we have seen people move to 4-bay NAS units in order to take advantage of RAID-10 (despite the loss of effective storage space). This helps to avoid (to a certain extent) risk-prone rebuilds associated with RAID-5 arrays. Entry-level 4-bay NAS units are important for any NAS vendor, evidenced in part by Western Digital's decision to launch the 4-bay WD EX4 ahead of the 2-bay WD EX2. The ix4-300d is also a popular member of LenovoEMC's ix-series. Synology is updating its entry in this price range market with the launch of the DS414j today, and appears to be an interesting alternative to the EX4 / ix4-300d. The DS414j sports the Mindspeed Comcerto C2200 dual-core communications processor. It has two Cortex-A9 cores running at 1.2 GHz. There are plenty of hardware acceleration engines in the SoC. 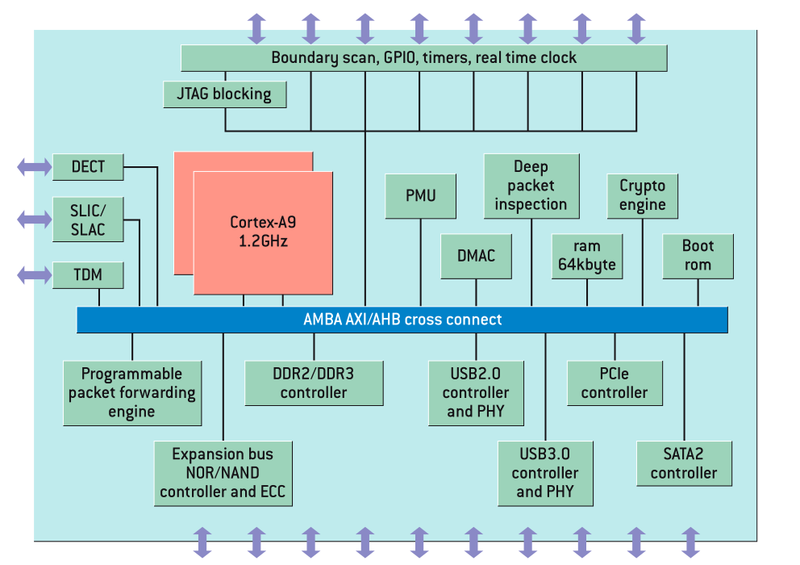 The block diagram above doesn't provide full details of the peripheral I/O. Fortunately, we do have some documentation (PDF) which indicate that the C2200 sports two SATA II ports, two PCIe 2.0 lanes, one USB 3.0 and one USB 2.0 port. This looks like a good platform choice, since the two additional SATA bays should get full bandwidth through the SATA - PCIe bridge (if implemented that way on the board). A look at the gallery above shows that the unit has only one USB 2.0 and one USB 3.0 port, pointing to the likely fact that there is no USB 3.0 - PCIe bridge in the equation. The SoC does have support for up to three GbE ports, but the 414j uses only one. Even though we have seen dual LAN ports making their way into a few ARM-based units, it looks like the j-series will tend to stress its entry-level credentials by sporting a single network interface only. The DS414j brings in all the exciting features of DSM 5.0 (along with its acclaimed apps for quick and easy remote access, private cloud features and backups) to the entry-level market. The unit is now shipping globally with a retail MSRP of $390. I notice the EXACT same problem with my DS212j. I use the VPN client on the NAS and the speeds are barely above 5Mb/s. When I use those same credentials elsewhere, say my desktop PC, I can saturate my 25Mb/s downstream. There is definitely a bottleneck and the CPU itself does not seem to be it. 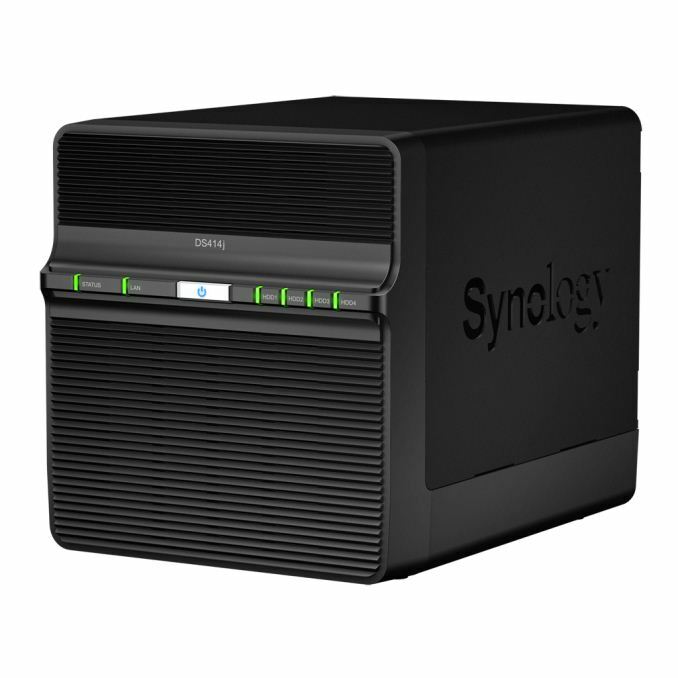 The offloading of encryption or not offloading is little the issue that Synology needs to perform some analysis around. Can someone please explain to me why a 4 bay enclosure is SO much more expensive than a 2 bay? I mean, twice the size of case, twice the drive mounting brackets and a SLIGHTLY higher end RAID controller. That's it, doesn't come anywhere near justifying a $280 mark-up.